Myra McEntire: Carrie Ryan: In the Fort on Bookanista Thursday! Carrie Ryan: In the Fort on Bookanista Thursday! I can only read Carrie Ryan books at the beach. When I first heard about THE FOREST OF HANDS AND TEETH, someone compared it to Twilight, saying, "It's Twilight, with zombies." So I didn't read it for a year, because I thought, "GROSS. Things fall OFF of zombies." I finally gave in because I kept hearing such wonderful reviews. Y'all. IT IS SO NOT TWILIGHT WITH ZOMBIES. It's a heartbreaking story about choices and loss and love and family - and there are zombies, but not like you think - and you should REALLY, REALLY read it. 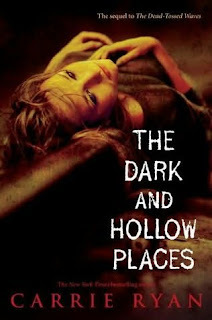 After FoHaT, you need to read DEAD TOSSED WAVES, and then Carrie's latest release, THE DARK AND HOLLOW PLACES. And then you need to come back and thank me. But don't read them at night. Or alone. Or in the dark. I was lucky enough to meet Carrie at the Decatur Book Festival last fall, and then I got to spend some time with her on Maggie Stiefvater's Branson Writer's Retreat. Here's the thing. She writes these AMAZING, GORGEOUS stories that rip your heart out. The language is flawless, the settings are haunting, and the characters are fleshed out (HA HA ZOMBIE JOKE). You'd think she'd be this brooding, serious, contemplative-type person. She acts out books, like some kind of one-woman stand up show. I'm pretty sure I know how Maggie's FOREVER ends, all thanks to Carrie. I'm just trying to figure out ... who rides a horse? Or a broom? And if there's a helicopter? Or was that a lasso? So enjoy Carrie's visit to The Fort, and if you haven't read her books, get on it! Like a zombie with a neck bone. Sun worshiper who wears SPF 50. In North Carolina in the summer? I might as well cram myself into my own freezer! Raft. Towing an inner tube behind with a cooler full of refreshing drinks. A zombie. (here's the link: http://en.wikipedia.org/wiki/Zombie_%28cocktail%29) I mean how can I not!? Love ghost stories though I will jump and freak out every time. I remember bits and pieces about the ghost who haunted my summer camp called... the GhoulaFletcher! Ooooooh, scary! But seriously, no way I'd go back to that camp alone at night. I guess I'd take the dare not to answer this question? Clearly we'd need lots of dancing in the fort and that means Madonna. Wait, am I showing my age? Love Actually. I can watch that movie a million times. Lit on fire and allowed to burn! Awake - I hate missing the fun! I'd want Sarah MacLean to come tell a love story... I'm a sucker for those! Elena Johnson Plays TAG, YOU'RE IT! I just got the ARC of The Dark and Hollow Places so I went out and bought the other two books and will read them one after the other. I am sure that I will love them. They look and sound amazing! Great post! Love your questions, Myra! And thumbs up on the inner tube pulling drinks behind the raft. 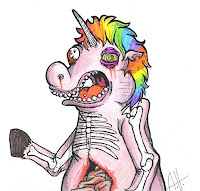 I would like a zombiecorn as a pet. Though I'm guessing it might be difficult to train.